Is everything getting too dwarf? Then try this statuesque beauty for the back of a sunny border! What’s more it’s fragrant too – it’s got a lot going for it! 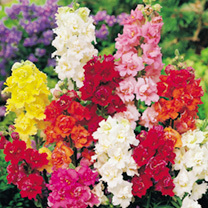 The double blooms are really attractive and come in a wide range of colours. Did we mention cut-flowers? Well it’s even great for that too! Height 90cm (3'). HP - Half perennial best grown as an annual. Tall growing. Sow January-April indoors for flowering June-October.